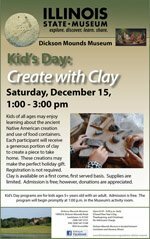 Kids of all ages may enjoy learning about the ancient Native American creation and use of food containers. Each participant will receive a generous portion of clay to create a piece to take home. These creations may make the perfect holiday gift. Registration is not required. Clay is available on a first come, first served basis. Supplies are limited. Admission is free; however, donations are appreciated.